Normally it shouldn't crash then. The plane just does nothing. Please install them in the above order. Normally these files are installed with Windows, and updated via the Windows update. Also check with Microsoft Windows updater, that no updates related to the above are missing. I´m 98% sure that the problem relates to some of the above files. The divers versions of the .net things etc are not UPDATED versions of the same thing, they exist next to each other on your computer in separate folders. If a program is compiled with the .net 2.0 runtime it will look for that on your computer. So though you might need all of these files, they are a pretty good thing to have on your computer. They do NOT slow anything down as they are only loaded when called. My FSX also crashes when I Load the Discus. turn off the UAC..it's the only way it worked for me. It's a bit o a pain since some of my other programs don' work with it off. so I have to turn on/off a couple of times a day which requires a re-boot. Actually i tried everything i know now. I bought Active Sky Advvanced today and turned CumulusX off to get the real weather thermics and it still CTD. I can not nail it to one thing that's happening shortly before CTD or a thing i am doing to provoke the CTD. It just happens or not. So, sorry, i don't know any more things to try on. I hope, you giys at Aerosoft and you, Jochen keep the patience and make it work somehow. I tried again and the "crash" occurs with the engine stowed and me increasing the throttle on my Saitek X-52, but it is intermittent it does not occur on every flight and it is only the BM. Probably idiosyncratic. It would make sense that everybody with a Vista CTD have a look at the Vista problem history (control panel - problem reports and solution) and post the FSX crash related content. I reported earlier that i got rid of the crashes by repairing C++ 2008, but i forgot to mention another step i took - i use only the sim probe ridge lift together with CumulusX, the thermals are disabled (only a green box behind sim probe, nowhere else on the CX control panel). Maybe worth a try ? Now I´ve tried everything I can find in these posts, no Winch X, rename B21_vario, new ASC, with and without Cumulus X, disable my UAC. Nothing works. What does FSX exactly, and when? Please describe it more detailed. I´ll try to explain what happens. When I start FSX it works perfectly. In free flight I can choose wich aircraft I want, except the Discus. 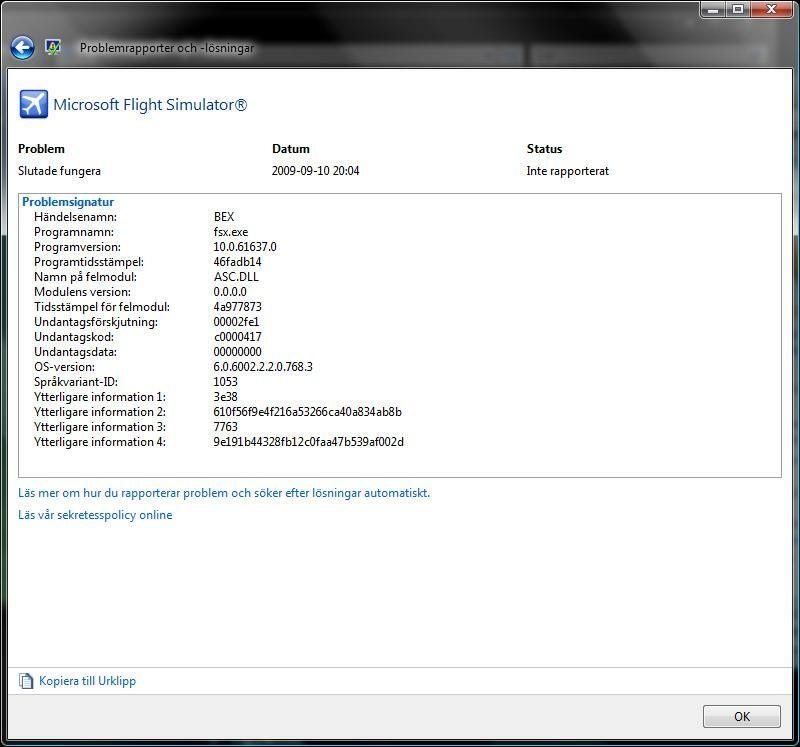 When I select it, it pops up in the preview window with no textures and then, like a second later FSX crash. If I start FSX in freeflight with another plane and fly around a bit, then change to Discus, it´s the same thing, I can see the Discus panel without any gauges for a second, then crash. I recently (last week) reinstalled my PC, or more exactly I did a Factory Image Restore. And as far as I can tell all Windows updates is there. I have FSX Acceleration, it´s the only game I have on this computer.